Recently I saw two sets of data on gun control. One set showed the percentage of households that have at least one firearm. Another showed the rate of gun deaths per 100,000 people. I spot-checked a few states and thought I saw a trend. 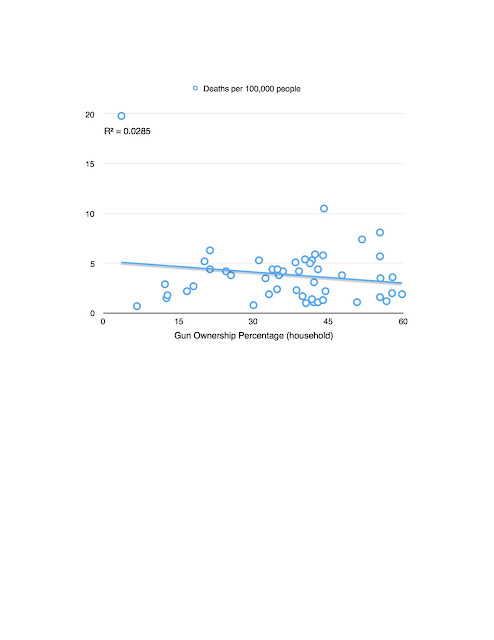 For example, DC has the lowest household percentage but the highest rate of deaths from firearms. Wyoming has the highest ownership rate but one of the lower death rates. I looked at a few others and thought I saw an strong (negative) correlation between these two sets. It appeared that as gun ownership increased, deaths decreased. Then I got the full set of data and plotted them on a scattergram. Nope, no correlation. According to the statistics gun ownership only explains 3% of the resulting rate of deaths. It doesn't change much if you omit DC as an outlier, except that the slope of the line is slightly positive--indicating that as ownership goes up so do deaths. The correlation is less than 2% without the DC outlier. This example is another that shows anecdotes aren't sufficient to know what the rest of the data will look like.